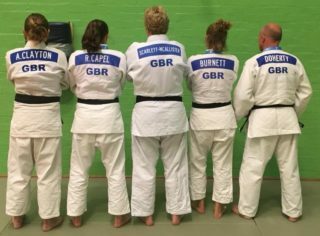 In April 2018, Oxford Judo sent a large group of competitors to the European Masters in Glasgow. Chris Doherty, Laura Scarlett-McAllister, Henry Winney, Rebecca Capel, Abigail Clayton, and Emma Burnett all competed in the individuals and teams, coming home with a total medal haul of 1 gold, 3 silvers, 1 bronze, and three fifth places between them. All in all, a pretty epic weekend.